I'm currently running a campaign where the players have discovered a door that leads into the sewers and catacombs of Zyan, a flying city in the dreamlands. My desire to run a game in the dreamlands is longstanding, tracing back all the way to my very first game of D&D. This is the story of the dreamlands and me. The first roleplaying game I ever played was in 5th grade in 1986. I knew what D&D was, since earlier that year I had traveled to the Compleat Strategist with my mother, who had, bless her heart, looked up that wonderful store in the phone book and taken me there to buy the Mentzer red box. Although it had thoroughly captured my imagination (damn you Bargle! ), I hadn't done anything more than draw hexmaps with a friend for an imagined future game. But that spring, a new kid named Sebastian ran a very strange game for four of us on the playground. He was the child of an itinerant punk scam artist. Although educationally disadvantaged by his sometimes homeless wanderings, he was a wonderful artist, and had an entirely unchained imagination. The game kicked off this way: each PC was visited in his dreams by a shadowy figure of immense power, the lord of the dreamlands, who offered us each a challenge. We would compete with other champions: whoever defeated him would receive that which he most desired. The rest would be lost to the dream world forever. He ran the game dicelessly and competitively, playing with each of us one on one in serial fashion. I don't remember much except that it was utterly mysterious, with symbolist elements, and was incredibly difficult. The only concrete memory, besides the dark wonder of the whole thing, was of being beaten by one of the other players in solving some puzzle. His PC was, as a reward, granted a wish, which he promptly redeemed for a magical sword with which to fight the lord of dreams in a duel. The rest of us witnessed the battle, fought on a thin bridge high above us. As it turned out, the character had over-reached, challenging the lord of the dreamlands too soon and in too direct a manner. He was slain. The player wept and we tried to console him. It was badass. I next encountered the dreamlands when, in middle school, I discovered H.P. Lovecraft, the only one of the three great Weird Tales authors (Robert E. Howard and Clark Ashton Smith being the others) that I stumbled across in my youth. I devoured all of his works. 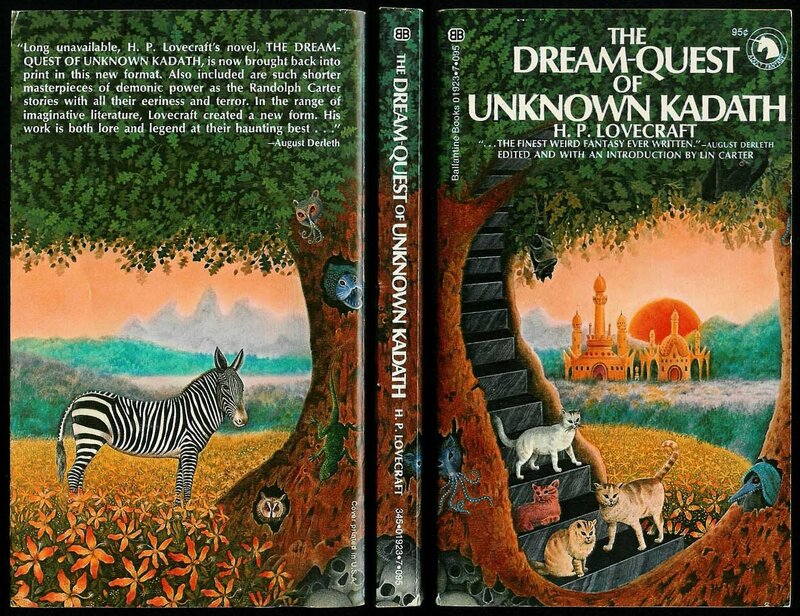 Contrary to the elevated opinions of the weird intelligentsia, I liked his dreamlands tales the best, and most of all The Dreamquest of Unknown Kadath. I reread the book just last week, and I can happily report that wonder still drips from every page: from Randolph Carter's longing to return to the fabulous city he glimpsed three times contrary to the will of the gods, to the frightening traders who come to Dylath-leen in black galleons, the rowers of which are never seen, and who trade always in rubies. 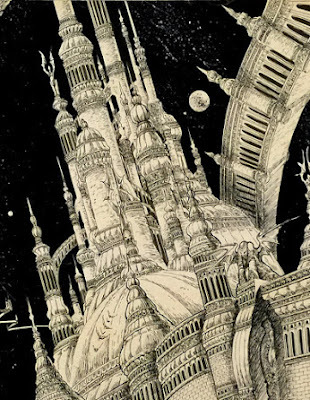 The abundance of Lovecraft's fertile imagination allows him to be a generous dispenser of bits of marvel, for example, the fact, casually mentioned, that only three "fully human" dreamers had ever crossed the perilous gulfs between the dreamland of the earth and those which surrounds Arcturus or Fomalhaut, or that the tree from which the Zoogs make wine grows from a seed thrown down from the moon. 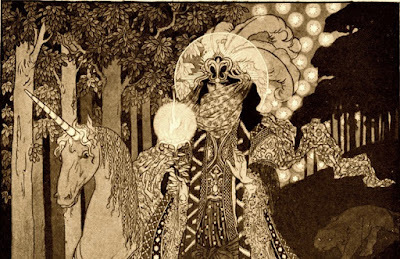 The idea that there are a few travelers who know the hidden ways to the dreamlands, and lead secret lives as explorers of that perilous and fantastical realm, made quite an impression on my teenage mind. 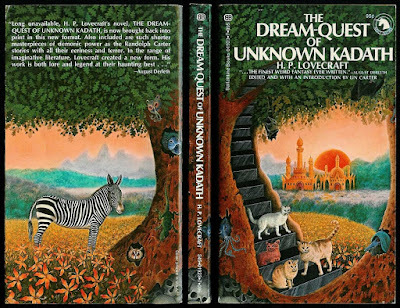 I suppose that I originally felt about Lovecraft's dreamlands something like the way Randolph Carter felt about his thrice-glimpsed city. I would defy the will of the gods if it would get me there. 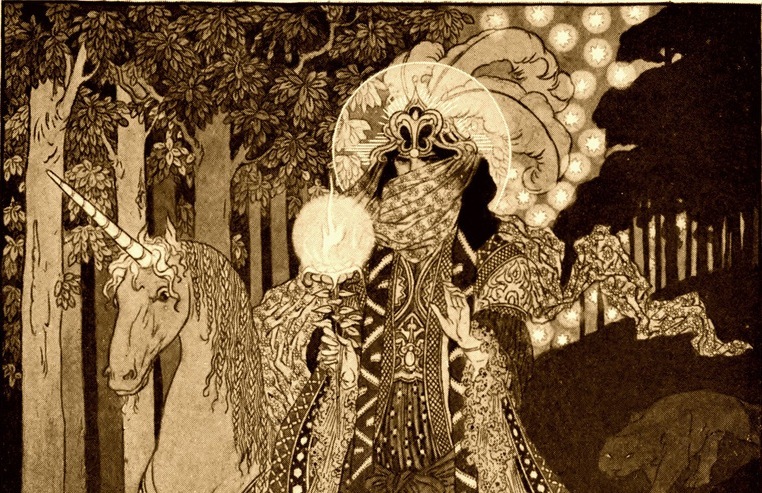 In adulthood, thanks to +Scott Driver, I discovered Lord Dunsany, whose work served as the inspiration for Lovecraft's dream tales. Most relevant here are the superb stories in A Dreamer's Tales, the best of which is "Idle Days on the Yann". 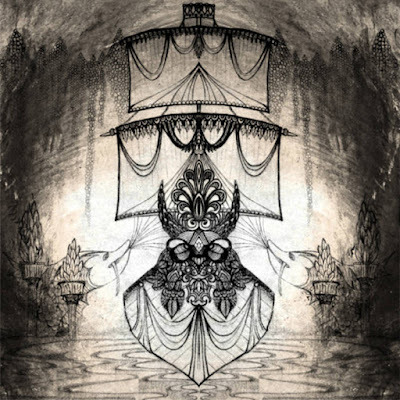 This story follows a veteran traveler of the land of dreams on his trip down the Yann River aboard the strange vessel Bird of the River. 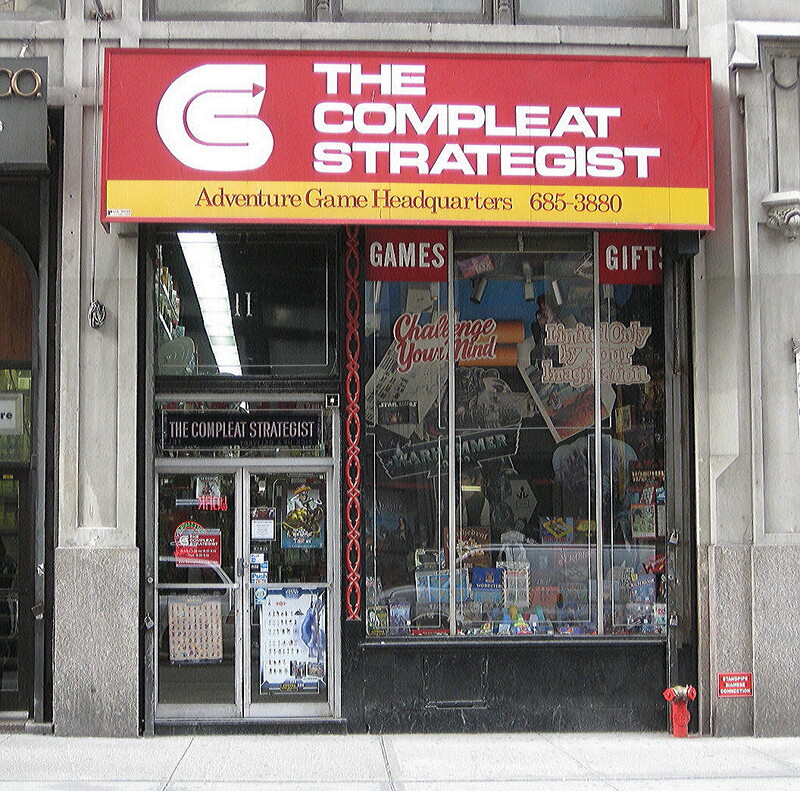 The sequel to this story, "The Shop in Go-by Street" was a direct influence on the conceit of my dreamlands campaign. Ask the owner of a certain shop in London for an impossible thing he cannot provide, and he will grudgingly conduct you to a back room full of idols, where a glowing cerulean door stands. This door leads to the cottages whose windows look out both on "the fields we know" and "the fields we do not know". These Dunsanian motifs of secret doorways hidden in plain sight were of special interest to me, because for a period as an adult I actually did manage to lead a kind of second life in my dreams. Starting in college, I suffered from regular insomnia. By the time I was in grad school, it had settled into a macabre rhythm. There was at least one night a week where I fell asleep only at dawn for exactly an hour. But what an hour! During that brief sojourn beyond the veil, I would dream intense lucid dreams. It always started the same way. I would realize I was falling asleep and try to get out of bed, while my body remained in place. When I had separated myself from my corporeal form, I would walk to my bedroom door. This simple wooden door, painted a plain white, so unremarkable in itself, was in that hour of dawn a portal to an unknown land. What lay beyond the door was always different. 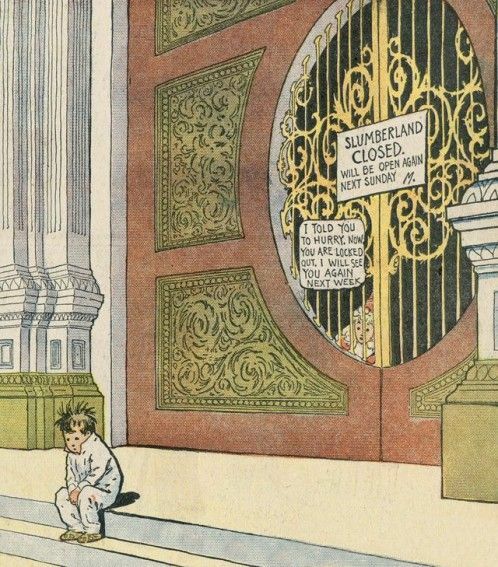 Sometimes it would open into the rest of my apartment, located now in a warren of buildings and hallways, with seemingly unending lines of strange painted doors. Other times, I would simply find a flight of stairs leading down, through mysterious tunnels, into the streets, alleys, and courtyards of some unknown city, dark and empty. Or perhaps it would lead to a narrow hallway with a single window, opening upon a world of interconnected rooftops and walkways. These experiences were remarkable and delicious, and some recompense for my perpetually exhausted waking life. These dreams ended in a dramatic way. The figures I met in these lucid dreams were clearly figments of my imagination, without life or will, soulless mannequins I projected onto the dark worlds I was traversing. But on my last trip through the door, I found myself backstage in a theater after a show. I followed a narrow staircase up to a dressing room. Inside was sitting an beautiful actress in a silk kimono. When her eyes met mine, I could tell there was real intelligence and consciousness behind them. I felt myself, for the first time in these lucid dreams, to be in the presence of someone who was not a mere projection. She told me that she was a changeling, which I understood to mean, in the strange understanding characteristic of dreams, that she had played the role of all those shadowy figures I had met in these lucid dreams. She told me gently, with some sadness in her voice, that she was going away for awhile and wouldn't be seeing me anymore. And I have never had a lucid dream since. That was 10 years ago. So what am I doing running this game in the dreamlands? Am I trying to get back through that door? To create a grown up version of what that crazy 10 year old genius Sebastian subjected us all to? To reproduce my original experience of wonder when I first read Lovecraft's dream tales? I answer with this. When the protagonist of "Idle Days on the Yann" converses with the sailors of the Bird of the River, he first tells them of his waking life in Ireland. The life he describes seems to them absurdly quotidian, and they mock him, saying, "There are no such places in the land of dreams." However, the protagonist continues, "When they had ceased to mock me, I explained that my fancy mostly dwelt in the desert of Cuppar-Nombo, about a beautiful city called Golthoth the Damned, which was sentineled all around by wolves and their shadows, and had been utterly desolate for years and years, because of a curse which the gods once spoke in anger and could never since recall. And sometimes my dreams took me as far as Pungar Vees, the red walled city where the fountains are, which trades with the Isles and Thul. When I said this they complimented me on the abode of my fancy, saying that, although they had never seen these cities, such places might well be imagined." If I find myself on a vessel in the land of dreams, and am mocked by seamen for my life grading papers and constructing meticulous arguments in the too solid City of Chicago, I will be able to defend myself thusly. "My fancy dwells mostly with Zyan, the flying pearl of the land of dreams. Its once gleaming towers rise to the heavens, and its opulent sunken courtyards, and narrow streets shield its residents from the bitter winds that blow across the endless Azure Sea that surrounds it. The Zyanese suffer from a great hopelessness, hiding always behind their gilded masks, for owing to a peculiar curse, their monarch is thwarted by a hidden double, as was his father and his father too. My fancy also dwells sometimes in the lush bowers of the inverted jungle that springs from the bottom of Zyan, an immense riot of fungal blooms, teeming with unseemly life. There hangs the ruins of the great Summer Palace of the Incandescent Kings, forgotten and crumbling." 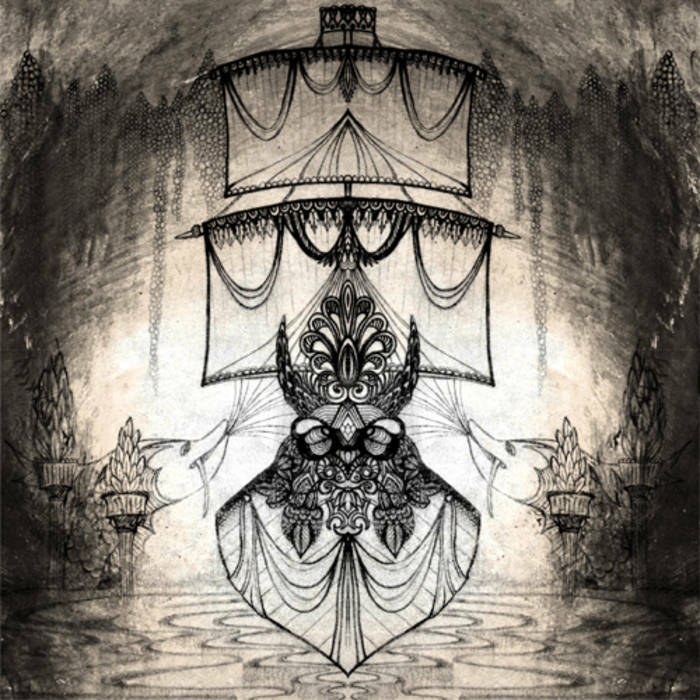 Perhaps then the sailors will compliment me on the abode of my fancy, saying that, although they have never been to Zyan, such a place might well be imagined in the land of dreams. The wonder of the Dreamlands is that you can take ANY campaign setting and side-slip the characters into the Dreamlands for a short or extended stay. I've thought of having a segue into the dreamlands from a gritty, low magic fantasy setting and a post-apocalyptic earth setting like Gamma World. I think both could present for some interesting contrasts/interfaces with the Dreamlands. It really is an untapped resource full of potential, at least for my campaigns. I agree. It's part of the reason why it's perfect for hangouts games that have fluctuating membership. Episodic forays into another reality. Have you looked at Coliseum Morpheuon, Faces of the Tarnished Soul, and Down the Rabbit Hole, all from Rite Publishing? I think you should. I haven't, but I certainly will. Thanks! I love the art and story line. Thanks! I should have put art credits up, I will do so now. Someone needs to track Sebastian down and do a documentary on him. Great story. After about 20 years of being out of touch, I talked to Sebastian 8 years ago. He emailed out of the blue, having tracked me down through the internet. He was living in Amsterdam, trying to get his life together. We talked for a long time (maybe an hour), but not mainly about gaming, and certainly not about this. I don't know how to contact him now, since my emails from that period are gone. I would love to find out how (or if) he remembers that game.